Have you ever wondered what it’s like to teach in an inner city school? As a teacher, you expect challenges from your students but if you don’t teach in the inner city, it’s hard to comprehend how big those challenges can be. This is the story of Cathy Seabourne, a teacher in an inner city school, her challenges and her success in using Maurice on the Moon to help teach struggling readers. Cathy teaches a reading intervention class for 9th graders at South East High School in South Gate, CA, which is located in the Los Angeles Unified School District. She has been teaching for 15 years. Her class is part of the Read 180 program, which is designed to raise reading achievement for struggling readers in grades 4-12+. Read 180 also focuses on improving their writing skills. At Cathy’s school, here are some basic statistics that illustrate the challenges of teaching at an inner city school. Students are typically at least 5 years behind in reading. Some 9th graders are at a 5th grade reading level and some as low as a 2nd grade reading level. Approximately 25% of the kids are proficient but 75% are at basic or far below basic reading levels. Approximately 60% of students will NOT graduate from the high school. Graduation rates are very low. Approximately only 3% will graduate from a 4-year university. Cathy also explains that in a lot of inner city schools, they ignore the struggling reader. A lot of times, “schools just find a young teacher” and that the schools just look at the scores and see if kids are improving. Fortunately for her kids, Cathy is an experienced teacher, always seeking to find ways to help them with their reading skills. Because of the environment in which they grow up and live, students have a desire to only read books that have the same environment as theirs. “If it’s not about the ghetto, most of them aren’t interested,” she adds. And because they have so much personal drama, they tend to want to read comfort books, which they are more likely to read and engage in. She notes that Flipped by Wendelin Van Draanen is an example of a comfort book that has been popular with her students. Another environmental issue is that South Gate is largely an immigrant city. Because of that, many students place family concerns far ahead of their own educational goals. Some parents want their kids to always stay close so they can be taken care of. So, although the parents want their children to graduate, they want them to be just good enough to graduate. Inherently, they don’t want their kids to read too much and become too smart. For her class, Cathy’s goals are to overcome these issues and more. Along with the challenges above, there are a lot of other issues at play. Cathy needs to consider that a lot of her kids “can’t read at 90 words a minute.” She goes on to explain that that is a benchmark. “If you read too slowly, you won’t remember a lot of things” due to how short-term memory works. She also wants to help transition her students from ‘learning to read’ to ‘reading to learn.’ She explains, “In grades 1-3, you are teaching kids how to learn to read. Somewhere in the 3rd-4th grades, kids transition to ‘reading to learn.’” A lot of Cathy’s kids have not yet made that transition. Cathy also continues to strive to find the ‘home-run book’ – those books that get the kid to open up to literature – the book that gets them to want to read the next book. Cathy is always reading and trying to find books that she can use in her classroom. Luckily, she knew author Daniel Barth, who wrote Maurice on the Moon, a book geared towards 5th-8th graders. She wanted to have her kids step outside their comfort zone and read a window book. Maurice on the Moon allowed her to do that easier than most because there was a lot of ‘mirror’ to it as well. For example, the kids loved the banter between the two young main characters, which they felt was very similar to conversations they might have in their lives. Yet, the book covers the adventure of a kid that lives on the Moon, wanting to go to the Earth. Given that the book is geared towards the 5th to 8th grade level, it was just a little bit harder than some of her students could read, which was good. “We need to push them just a little,” she added. A common statement from her kids is “I don’t understand” or “I don’t get it.” But with Maurice, she heard a lot of “I get it!” comments. The students themselves felt they didn’t need any kind of primer on science before reading the book – that the science came at the right pace. 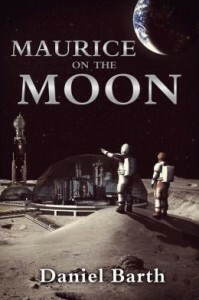 Some of the other benefits of Maurice on the Moon was that it was a short book and that the chapters were well-named. Kids would ask why the chapter was titled as such and that it allowed the kids to do critical thinking about the chapter titles. One can only imagine how they will respond when they actually get to meet and ask Dan all their questions. This is Part I of a two-part article on teaching in the inner city. Part II can be found here.